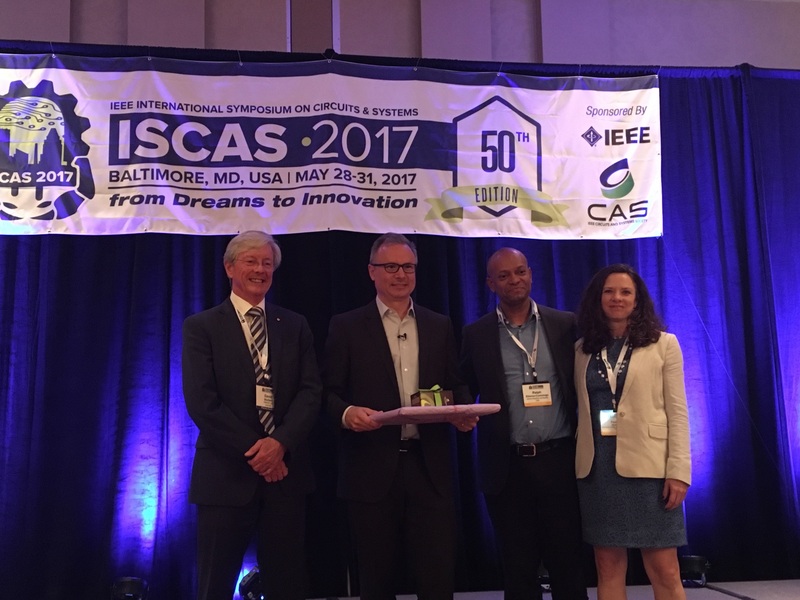 Approximately 1,200 research scientists, engineers, and industry partners from around the world attended the 50th edition of the IEEE International Symposium on Circuits and Systems (ISCAS), held May 28-31, 2017 in Baltimore, Maryland. IEEE ISCAS is a premier annual conference that reflects on the diversity, creativity, and significance of Circuits and Systems as a field, as well as the technological applications and knowledge economy that are based on Circuits and Systems fundamentals. This was the first time the conference was held in the United States in many years. Throughout the conference current research findings, ideas, and applications in circuits and systems were presented in workshops and tutorials, plenary sessions, industrial panels, circuits and systems demonstrations, industrial innovation sessions, and social activities. Two sessions were held highlighting Pioneers of CAS, which honored distinguished delegates from the first years of ISCAS as they shared their perspectives on important technical achievements over the past 50 years and into the future. Prof. Pamela Abshire (ECE/ISR), who served as General Co-Chair of ISCAS, introduced ECE Professor and Director of the Microsystems Laboratory at UMD, Dr. Robert Newcomb (ECE), during the Pioneers of CAS Session on Monday, May 29th. Prof. Newcomb was recognized as a true Pioneer in the Industry, and spoke about his experience in the IEEE Circuits and Systems (CAS) Society and his participation in the first conference in 1967. Newcomb and other Pioneers of CAS were in agreement that the future of CAS will be to advanced in the medical industry and to understand the human body better. The Present Your Startup session at ISCAS aimed to promote industry participation and entrepreneurship by showcasing new ventures resulting from research in the CAS community session. Prof. Neil Goldsman (ECE) presented his start-up company, CoolCAD Electronics, LLC, a CAD and custom electronics design firm, which he co-founded in 2009, and won the Innovation award at the close of the session. The Innovation prize is chosen by a special jury for new ventures showcasing the best overall innovation. The event was sponsored by the IEEE, and the Institute for Systems Research (ISR) and the Electrical and Computer Engineering (ECE) Department were both promotional sponsors of the event. In addition, ECE Prof. Timothy K. Horiuchi served as a Tutorial Co-Chair, and ECE Ph.D. student Andrew Berkovich served as volunteer coordinator at ISCAS.